Harold Pinter was a long-standing friend and supporter of W.S. Graham. What follows is taken from an interview given by Pinter during The Ilkley Literature Festival, which in 1994, with an exhibition entitled The Constructed Space was celebrating the life and work of the late poet. "I first read his poetry in 1949, that's a bloody long time ago now, I was 20. I'll have to use a word which is over done - I found his language magical. It's as simple as that. What happens when you read a poem that sends a shiver is a mysterious thing. I find it very difficult to analyse. When you have a unique sense of language like Graham or Shakespeare you come across a line which just hits you midships and sends you all aflutter. I'm not a scholar, I'm just a chap who like poetry. I never break things down. I think he's the most wonderful poet with unique lyrical gifts. He could sing like nobody's business and he had enormous skill in handling verse. I know no other poet who can move through about three lines and come out in the fourth in one breath. It's a remarkable genius but it also takes a lot of work. He's dealing with such delicate potentials - silence and the other side of language. He's very courageous in trying to define something which is otherwise indefinable." William Sydney Graham (1918-1986) was born in Greenock, Scotland, 'beside the sugar house quays'-a setting open to the sea. He remained a Celt, moving from Scotland to Cornwall where he found seascapes without urban clutter, just an occasional ruined tin-mine with its human echo. In the 1950s and 1960s he became a key member of the artistic scene in St Ives. A friend of T.S. Eliot, Dylan Thomas, Edwin Morgan, Roger Hilton, Peter Lanyon and many others, he could be demanding, but he gave back generously. A prolific letter-writer, he is first heard here in the passionate apprentice years, then writing from and of Fitzrovia, the Apocalypse, and his years in Cornwall after The Nightfishing (1955). We come at last to his apotheosis in the brilliance and wry wisdom of his late work. Dedication an commitment to his craft produced an extraordinary body of work during a life lived wildly and to the full. These letters (interspersed with poems and drawings) are a testament to the close intellectual and spiritual bonds which nourished his writing over many years. British poetry, deprived of Philip Larkin and Robert Graves in December, has now lost W. S. Graham who died on January 9th. Four years older than Larkin, he was a poet of equal stature and integrity. Like Larkin, his reputation rests on three collections and it has become something of a critical truism to observe that Graham's first major book "The Nightfishing," was obscured by the publication in the same year (1955) of Larkin's epoch-making collection, "The Less - Deceived." On the basis of his earlier poems, W. S. Graham was too closely identified with the word-drunk Dylan Thomas to be considered relevant to the more sober literary climate of the '50s. Although he became one of the most original voices of the century with the publication of "Malcolm Mooney's Land" and 'Implements in Their Places,' and was equipped with a playful and comical style his audience remained a shamefully restricted one. William Sydney Graham was born to his West of Ireland mother at "five o'clock the bright nineteenth of November nineteen eighteen." The birthplace was a Greenock tenement with the cruelly ironic address, One Hope Street. He received no third-level education apart from a year studying literature and philosophy at an adult education centre near Edinburgh. He served his time as an engineer but had no occupation, apart from writing, for most of his life. Consequently, he knew periods of great poverty; and while things had improved by the time he and his devoted wife, Nessie, were visited by an interviewer from The observer in 1978, conditions at their Cornish cottage were by no means idyllic "We have no telephone or car, an outside toilet with jug of flowering currant. I did get an Arts Council Grant in 1975. Also I have a Civil List Pension. That works out really at not very much. When something comes up like fixing the front door or thinking of a bathroom or buying clothes or doctoring my poor boy (I mean my cat) we have little, but I am able to put the Capitals at the beginning of my lines and cook a good steak and kidney pie." Graham's potential-as a writer was recognised by T.S.Eliot, the most prescient of publishers who brought out "The White Threshold," at Faber and Faber in 1949. But he did not become a poet of real achievement until "The Nightfishing" in which his distinctive poetical rhythms were harnessed to the rhythms of the sea to generate verse of tremendous power and energy. He used language as if he were discovering it as he went along. Struggling against its "obstacles" as he climbed to "the world's crest his syntax would become warped and his constructions get knocked out of joint. Amazingly, the results of such exertions were often very lilting and musical. Language itself became a central obsession of his later work, especially in the incomparable "Malcolm Mooney's Land" (1970). This book appeared after a fifteen your gap and evinced a desire on the part of the poet to make contact in the most direct way possible with his readers: "Anyhow here we are and never / Before have we two faced each other who face / Each other now across this abstract scene." Graham's own language, once clotted and opaque became increasingly simple and affecting, until the limpid later poems seemed almost like translations from the maddeningly obscure diction of his apprenticeship days. Indeed in an uncollected poem, he remarked that he had begun "to speak what I think is / My home tongue," and "to translate/English into English." Yet his words retained much of their sense of mystery and paradox and the overall effect was of what he had once termed "Intellect sung in a garment of innocence." Again I will not know you. Speaks to you will not be me. A creature in its abstract cage asleep. Your dreams blindfold you by the light they make. Your house silent by the speaking sea. I leave this at your ear for when you wake. Graham's principal publisher, beginning with "The White Threshold" (1949), was Faber and Faber, at which T. S. Eliot (1888-1965) was a director. Eliot admired Graham's work, but said it was difficult and would sell slowly because people did not like to think. He worked for periods as a copywriter, fisherman, and auxiliary coastguard while at Gurnard's Head, but he concentrated himself almost exclusively on his poetry. He is said to have been an impressive reader of his own work, in public appearances he made in Britain and abroad. "Malcolm Mooney's Land" (1970) and "Implements In Their Places" (1977) were both Poetry Book Society choices. In 1954 he married Agnes ("Nessie") Kilpatrick, daughter of David Dunsmuir, and from 1967 they lived at 4 Mountview Cottages, Madron. They had no children. Graham's collection "2ND Poems" (1945) was not his second collection; its title is a coded dedication "To Nessie Dunsmuir". Over the years Graham received small grants from the Arts Council, and he was granted a civil list pension of £500 per year in 1974. 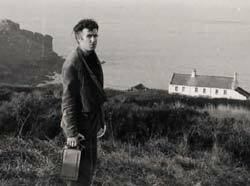 After a long illness with cancer, Graham died at Madron on 9 January 1986. Information was kindly supplied by Graham's close friend and literary executor, Michael Seward Snow. W S Graham selected by Nessie Dunsmuir (Greville Press 1998).